If you were expecting the same price as its predecessors, you’re in for a surprise. THE LATEST ADDITION to Apple’s TV range is now available to order on its website. The new media streaming device costs €179 for the 32GB version, a jump from the €79 price tag given to the previous version, and €229 if you want 64GB of storage space. The new set-top box brings with it some hardware and software changes, but the biggest change comes in the form of third-party apps. Previously, Apple TV only came with pre-approved services like Netflix, but the new focus means anyone can develop apps for the service. Other updates are a revamped remote control, which comes with a touchpad designed for navigation as well as playing games. It also comes with an accelerometer and gyroscope designed for motion control gaming, similar to the Nintendo Wii and Wii U, and supports third-party Bluetooth controllers. The device comes with universal search allowing users to find content like shows across different services, and Apple intends to open this up so other apps can avail of it. The company says the first devices ordered today will arrive within three to five working days. Apple isn’t the only one revamping its smart TV collection. Google recently announced its updated Chromecast, which costs €39 and comes with its own upgrades like improved streaming. It also announced another version called Chromecast Music, designed to link up to your speakers and stream music over WiFi. 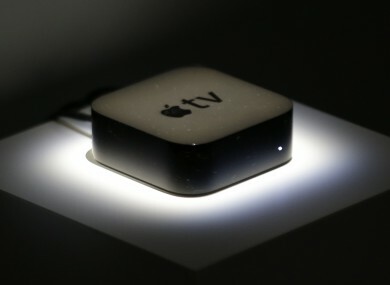 Email “Apple's revamped TV set-top box can now be ordered, but it comes with a price increase”. Feedback on “Apple's revamped TV set-top box can now be ordered, but it comes with a price increase”.